Carlsbad West living with ocean views | This modern, 2 bedroom, 2 full bath condo has been beautifully remodeled throughout with high-end finishes. 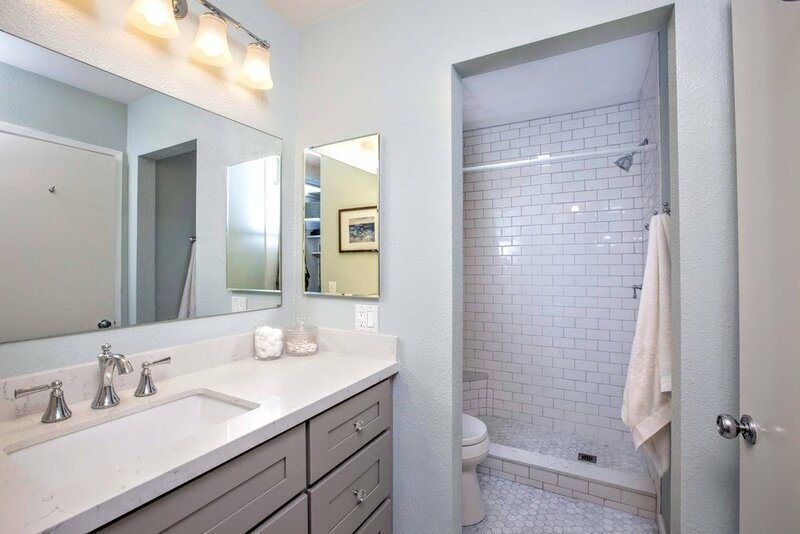 Upgrades include: new windows & sliders, new Pergo+ laminate flooring (pet proof/water proof), quartz counter-tops, Carrara marble bathroom flooring, Moen & Kohler fixtures in bathrooms and GE & LG stainless kitchen appliances. This condo offers 3 patios including a bonus patio off of the kitchen/dining area- perfect for grilling & enjoying the nightly sunsets. Coastal Carlsbad living at it's finest! This condo is in an excellent school district that includes: Pacific Rim Elementary, Aviara Oaks Middle & Carlsbad High. You must see this home to appreciate the pride of ownership. High-end upgrades include: Pergo Outlast+ laminate flooring with SpillProtect, waterproof technology & SurfaceDefense wear protection. Guest room offers a Jack-and-Jill bathroom.